Welcome to the world of A Dog’s Purpose, the New York Times and USA Today bestselling novel by W. Bruce Cameron. Ellie's Story, Bailey's Story, Molly's Story, and Max’s Story are four heartwarming novels for young readers inspired by A Dog’s Purpose and its sequel A Dog’s Journey. 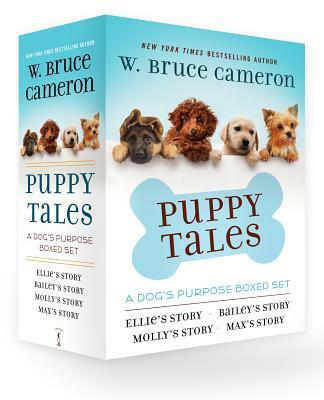 The Puppy Tales boxed set contains all four hardcover books and is the perfect holiday gift for young animal lovers. These charmingly-illustrated stories are just right for middle-grade readers ages 8 to 12, and each book includes a discussion-and-activity guide that can be used at home and in the classroom. Fans of the books and the movie can now share the world of A Dog’s Purpose with the whole family!